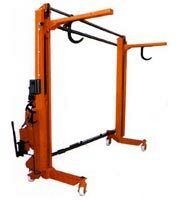 Beam Mounting Trolley that we manufacture, export and supply is ideal for lifting the pile from floor & to put it on loom. Our TPL - 106 Pile Beam Mounting Trolley is useful for handling pile beam (top beam) for terry towel & furnishing fabric unit. The lifting operation is performed by heavy duty electro-hydraulic power pack unit. The width of the trolley can be adjusted (narrow/wide) as per the width of the loom. It is suitable for loom having width from 200 cm to 380 cm, beam flange diameter from 800 mm to 1250 mm & lifting capacity up to 2500 kg.